Some of the main Jinguashi Peaks: Mts Keelung, an unnamed hump, Teapot and Banping. From the summit of Canguangliao. A lot has been written about this hike. It's rightly one of the most popular hikes in the area and well-signposted. I don't think I need to add much to what's been covered well in lots of other blogs such as this one and this one. I will add that the teapot itself is a little rougher than I expected and you do need to be ok with heights while scrambling up through and across it. The trail to Banping ("half flat mountain", as it looks a little like the top has been sliced off) is steep but not very technical and the Banping Ridge itself is not especially difficult, but watch out for high winds. Start the hike in the Jinguashi Temple car park. When you reach the Caoshan Defense Road you have a few choices: climb Mt Canguangliao, skip that and descend to Mudan, or descend on the route to the Jinguashi gold park. The teapot trail is steep and rocky in places. I wouldn't recommend taking a dog. But Stevie is a good mountain dog. Every time I come up here I find a new trail. This is why this post is part one of probably many to follow. Just to the left after exiting the Mt Banping Trail is the steep climb to Mt Canguangliao (brilliant light mountain). This hike is of similar difficulty to the Banping walk with a few fixed ropes and rock faces to negotiate. It's easy to follow with no branching trails. There's a fantastic view taking in all the major Jinguashi Peaks and the Ruifang Valley from the top. You can also see as far as Keelung and Fulong. The descent will bring you to a dirt road next to a small ruined building and an earth god temple. There are three main routes down this side of the mountain ridge. They all end a few kilometers from the sleepy Mudan Station which has trains to Taipei. To see them a little more clearly use the Hidden Taiwan Map where I've marked the routes. One is the Canguangliao Historic Trail, another is a fairly substantial branch of this trail, and the third is the Diaoshan Historic Trail. There's not really a lot to say about Mudan. It's really just a train station, a few sleepy old streets, and this pinnacle oddity. Maybe it's a little busier at the weekends. Bring supplies from Taipei if you're starting any hikes here. Coming from Caoshan Defense Road you will see this sign marking the start of this trail. Head down towards the ruined brick building and turn left (staying on the road). If you're coming from the base of the Mt Canguangliao Trail turn left onto the road at the ruined building and then left again. You can reach the trail by walking through the open cast mine area but the ground is very uneven and rocky. You'll soon enter a forest area and see steps down on your right. To the left up a small track is this ruined house in a sea of silvergrass. This trail is a lot less developed than the Diaoshan one and is a mix of dirt tracks and steps. However the steps are not the manicured wide concrete ones found on a lot of trails and they don't ruin the atmosphere. A little way along you'll come to the ganzaidian ruin. This was a small post stop from the days when this was an area for military patrols in the Qing Dynasty. There are a few branching trails on this route, ignore them all apart from the one at this sign. This is where the long branch trail described below forks off and follows the perimeter of the valley, rejoining at the small check dam. Staying on the main trail there are a few switchbacks around some pretty waterfalls as the trail heads into the valley. Keep an eye open for the dam ruins on the left. This is an enormous structure which I totally wasn't expecting. I thought the dam ruins would be some tiny embankment type thing. There's a path onto the top of the dam itself which is quite far above the treetops. It dates from the Japanese era when the population of this area was much larger. Just downstream from the dam is the old pumping station. A little further there is a check dam with some stepping stones crossing the river. Do not cross here. This is where the long trail branch rejoins the path. Instead, follow a narrow path around the bank of the river and continue down the wide path. The trail ends at a junction with the Diaoshan Historic Trail. A few kilometers down a quiet country road is Mudan Station. This branch is signposted well from the Mudan end but not at all from the Jinguashi side. If you're coming from Mudan cross the river at the small dam in the picture above and climb steeply up. From the Jinguashi side follow the main trail until you come to the sign shown a few pics above, near the ganzaidian ruins. Take the non-signposted fork. This trail is much wilder and less traveled than any of the other trails in this post. A few minutes in you'll pass an old bridgehead, some abandoned machines and a roofless Qing era building. Beyond that there's just forest, a blink and you'll miss it ruined house, and small rivers to ford. This trail is strenuous from the Mudan side with a lot of ups and downs. It's also a favorite of those little spiders that build their webs across the path. I'm seen as some sort of apocalypse in tiny spider culture now. I climbed this trail from the Mudan side. It was miserable going up it to be honest. The first kilometer is on a very steep paved road and the rest is on stone steps. Where the road turns to steps there are a few old ruined houses. Further up is Wuyuan Grave from 1902. Known as the Fruitless Grave in English there are a few stories surrounding this monument detailed on this site. In one, a Japanese engineer was assigned to Taiwan and never returned to his fiance in Japan. She traveled to Taiwan and after failing to find him erected this grave. In another, a Japanese man falls in love with a Taiwanese woman. While he is in Japan seeking parental approval for marriage she passes away and he erects this grave. Another involves a gold prospector who goes broke. He erects this monument to his fruitless search. The most tragic involves a Japanese gold prospector who fell to his death from the trail. While taking his ashes back to Japan his wife falls ill and dies. The monument was erected by locals to commemorate their suffering. The uppermost parts of the trail going through a pretty treeless valley are nice, but this is definitely a trail to descend and not climb. 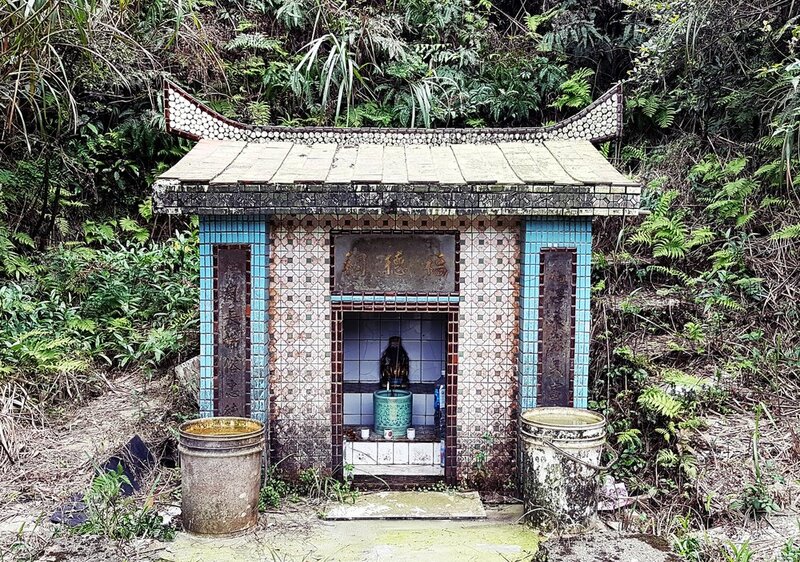 The top of the trail can be found next to an earth god shrine on the Caoshan Defense Road. The Canguangliao Trail and this one make quite a nice loop route. In case you don't want to take a long route down to Mudan from the Caoshan Defense Road there are some routes back down to Jinguashi where a bus to Taipei leaves from. You could also head over to Jiufen from there. From the Banping Trail entrance turn right and follow the Caoshan Defense Road. Take the first path on the right. This will pass near to the Benshan Geopark, which is really just a large old quarry, then the Benshan No4 mine area and the Jinguashi Shinto Shrine.